Gigabit PCI Express is not supportedd. Can I use USB 3 to Ethernet adapter? Post subject: Gigabit PCI Express is not supportedd. Can I use USB 3 to Ethernet adapter? I am running Codesys Control RTE on windows 10, PC is based on i7-7700 CPU. I purchased the TP-LINK TG-3468 ethernet adapter but Iv couldn't install the driver for Ethercat support. the chipset is Realtek PCIe GBE Family Controller. When I Uninstall, the driver reinstalls automatically. When I disable automatic install of drivers, I can't see it in the device manager and when I click "scan for hardware changes" it installs the regular driver again. So I thought about buying the USB 3 - ethernet adapter. Post subject: Re: Gigabit PCI Express is not supportedd. Can I use USB 3 to Ethernet adapter? I would recommend to buy a networkadapter which has a proved chipset to work with Control RTE. Realtek RTL8139 (und kompatiblen) Ethernet-Contoller. the 8100 und 8110 are compatible too. Ok, but how do I install the drivers in Windows 10? When I Uninstall the stock driver, the driver reinstalls automatically. 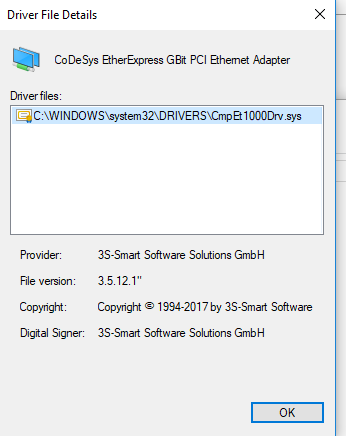 When I disable automatic install of drivers, I can't see it in the device manager anymore and when I click "scan for hardware changes" it installs the regular driver again. 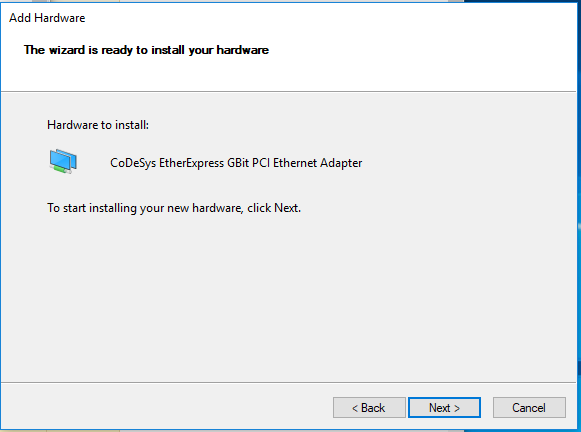 The only way I found to install the Codesys driver is to uninstall the stock driver and then click on "add legacy hardware". 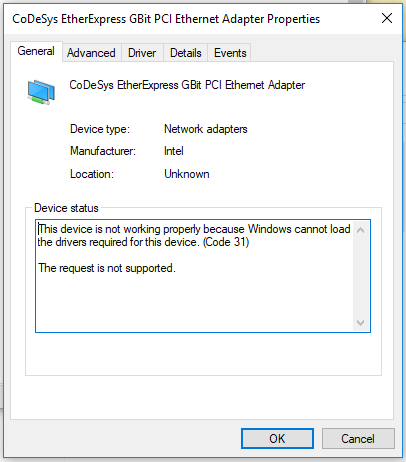 I then browsed to the Codesys CmpEt1000Mpd folder, but now I have the error "This device is not working properly because Windows cannot load the drivers required for this device. (Code 31)" in the device manager. And there is a yellow warning sign near the device. OK I managed to install the driver finally... only with group policy editor. Now when I declare a softmotion project, everything looks fine except for the task that was created for the ethertcat master device. the warning I have is "no POU defined for task - ethercat task"
although I can run the program with no problems. I have another task for a regular application.